Mike Lee tax plan: Smoke and mirrors or a great idea? 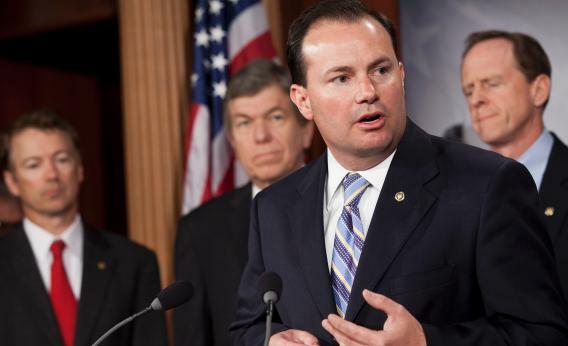 Sen. Mike Lee, R-Utah, speaks during a news conference on Capitol Hill on July 7, 2011. His tax plan seems good at first, but it needs to be scored. Sen. Mike Lee of Utah is out with a new tax plan that on a conceptual level is absolutely where Republicans should be heading. Right now, Democrats generally want to increase taxes on the wealthy in order to finance more spending on domestic social services. Republicans counter that much of this domestic spending is wasted, but their counterproposal consists of tax cuts for the rich. That offers nothing for the middle class even if lots of the Democrats’ spending is wasteful. Lee’s idea is different. He says he wants to keep tax revenue roughly where it is (18 to 20 percent of GDP) and offer middle-class families a large tax cut in the form of “an additional $2,500-per child tax credit, available to all parents of dependent children and applicable to payroll taxes as well as income taxes.” Then the idea is to have a mildly progressive income tax beyond that. A $2,000 personal credit, then a 15 percent tax on income up to $87,850 for single people ($175,700 for married couples) and a 35 percent tax on income above that. He also implements a couple of distributionally progressive measures that are designed to stick it to specifically people living in blue states. The mortgage interest tax deduction will be capped at $300,000 worth of principle, and the state and local tax deduction will be eliminated. So all in all the Lee plan would reduce taxes on middle-class parents, and raise taxes on upper-middle-class people who own expensive homes in high-tax states. People like me, in other words. Except Josh Barro, in the course of gushing over the plan, confessed that despite being an affluent childless person his taxes would fall under Lee’s plan. So I ran it with my numbers and found the same thing. If I weren’t married, Lee would saddle me with a small tax hike thanks to the reduced value of the mortgage tax deduction. But I am married, so my wife and I—the very picture of Blue America decadence in Logan Circle with no kids—are in line for a tax cut. Now if it’s actually true that you can meet all of Mike Lee’s goals consistent with giving me a small tax cut, then good for him. But I’m suspicious that what we’ve got here is simply a tax plan that doesn’t add up. If Lee wants to collect accolades for this plan, he’s going to need to get it rigorously scored by someone credible. The Tax Policy Center would be the ideal place to turn.